Well summer is officially here but the weather seems to have gone on holiday! Actually, its not as bad as I make out. Up here in the mountains we have had our fair share of cloud, rain and wind however, we are fortunate to be able to drive 10 minutes down the mountain and into the sunshine and warmth. June arrived with a visit to the Theatre. The local drama company 'MADS' were presenting 'Relatively Speaking' in the Funchal theatre. We enjoyed the play which was followed up with dinner in a local restaurant. 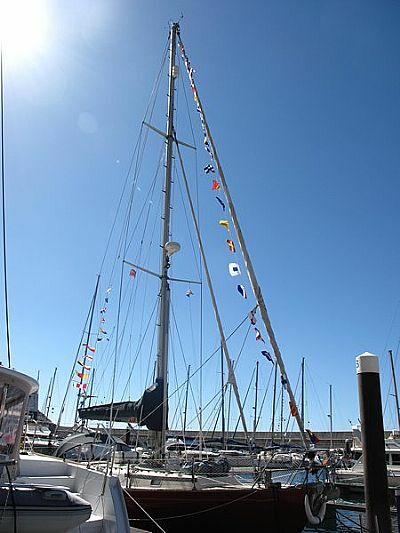 The following weekend we were invited to participate in the local Sailing Association Regatta. 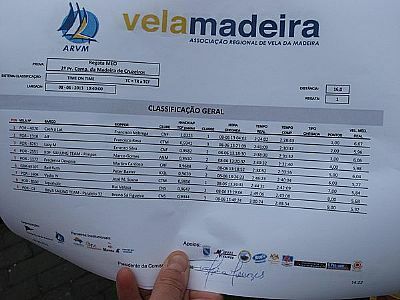 This was the second race in the series and was to be held in Machico Bay sailing east to Quinta de Lorde, south to the Desertas Islands and back to Machico. We dressed Red Ruth accordingly in the sponsors logo's and set off with two additional crew members that we met only that morning. 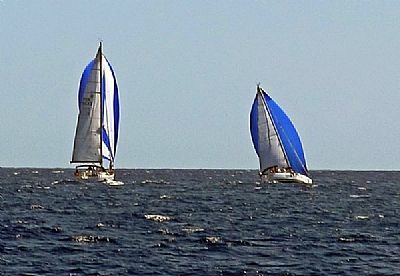 The race was delayed by 10 minutes to allow cruisers from Funchal to arrive (they were fighting the tide). We did our usual start line performance and crossed the line last - keeping well out of the way of those who are truly serious about the racing. Not long after crossing the line we overtook a yacht. Then it was all eyes open for the next mark. The race marks cannot be anchored bouys as the ocean depth is so vast close in to shore so, a small boat or rib is used as the race mark. It was quite humorous to see the first mark racing past us at full speed to get there before the first yacht. The second mark was out toward the Desertas Islands so the rib broadcast the co-ordinates on VHF to all yachts. Unfortunately we were so intent on the sailing that our Portuguese failed us - so we implemented Plan A and followed the yachts in front! 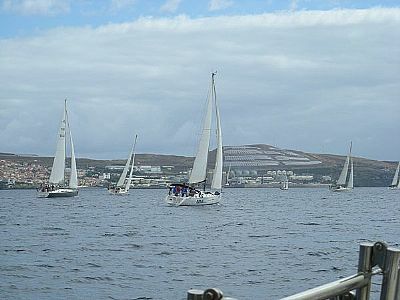 The course had been shortened from the original 25 nautical miles to 18 as the weather forecast was for light northerly winds. Again no-one told the weather that was what it should be doing! As we crossed the start line the wind speed was around 17 knots and by the time we were round the first mark it was blowing steadily between 20 and 23 knots from the north east - Perfect for Red Ruth! The serious racers had the spinnakers up on the second leg but we preferred to race with our standard sail configuration. On the last leg we decided that we were definately catching up with the yachts ahead of us and, with much exhiliration, we passed another yacht, Aquaholic. We were scooting along at 8 knots and thoroughly enjoying ourselves. The final results gave us a second in Class and 6th Overall - not too shabby! 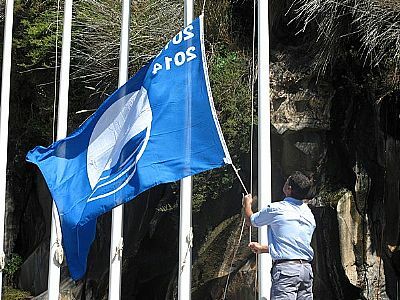 On 15th June we were invited to attend the Blue Flag ceremony at Quinta de Lorde Marina. We were asked to dress Red Ruth again to celebrate the occassion so up went the Signal Flag bunting. pic: Signal Flag bunting - dressed in style - and the sun is out too! The flag has been awarded for a Clean Water and Environment Marina and we truly believe that they deserve the award. The water is crystal clear and full of fish, the eco-point for recycling is well looked after and no rubbish is left lying around. July 2013 - During July we provided some Informational talks to the M3A (University of the 3rd Age in Madeira). These talks were to provide those who were interested with basic detail on becoming 'competent crew' and 'sea safety'. There were 10 attendees who will now join us for day sails around the Island. 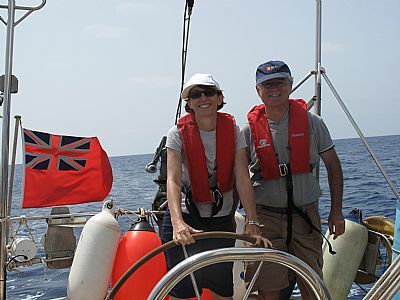 We really enjoyed sharing our love of sailing with the group and now look forward to some great sail days. September was a busy month with a visit to the UK and visitors from the UK. We, as always, love having people to visit and, again as always, we ate and drank too much! Some sailing was done however with day sails every weekend. A few of those on the course managed to get out with us and enjoy the weather, although there was one Saturday that was a little lumpy and left one or two feeling a bit 'green around the edges'. 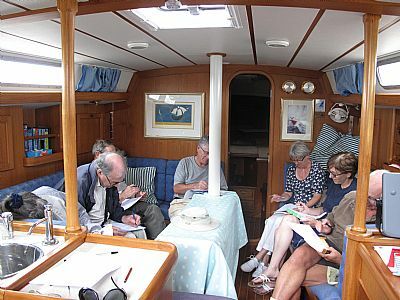 Those of the group who had been in the UK over the summer and had now returned were able to get a days sailing in. We received a call from the Marina on the last weekend of September inviting us to participate in the end of season Regatta. The morning was beautiful with a predicted 6 knot wind from the West - not good for racing! We got ourselves to the start line but managed to be the last across the line - a few problems with a foresail that wanted to hug the babystay all morning instead of working! We eventually crossed the line just as the marshalls were taking in the buoy. Winds had freshened a little so we had enough to get us moving which allowed us to pass one yacht before changing course for the next bouy. As the instructions were in Portuguese and all the radio calls were in Portuguese we were not one hundred percent sure where the marks were but our tactics payed off and we managed to 'pass' another yacht. Heading to the second mark the winds picked up to 25 knots giving us a good run with all sails out. Once past the mark the wind died away completely and we were going nowhere! We could see the yachts ahead also had no wind and they were stationary for a good hour, so we made the decision that rather than sitting in the sun going nowhere for the next few hours (and not finishing the race within the limit anyway) we would abandon. As we were leaving the marina after squaring everything away and washing down the yacht the wind picked up again and we could hear the front runners being 'horned' across the finish. It was a good day out. At the house we have work going on to open the basement and install a driveway. It was hoped that this would be completed early in September as the weather can often be wet up in the mountains during this month. The hopes were dashed though as the weather did what it was supposed to and several days were washed out due to rain. Things are nearing completion now and we look forward to a 'completion party'. Our dog is also doing well following his treatment for heartworm. He is bouncy and full of energy with his sores healing nicely. In fact he is at that 'rebellious teenager' stage where he knows what he should do but often does the complete opposite. He has had a few 'outings' on his own and comes back feeling exhilirated. Our worry about him getting out is that his road sense is non-existent so with the blind bends on the roads he is at risk. October 2013 - What a nice surprise we had to the start of the month. We went down to the Marina and as usual, stuck our heads into the office to say hello. The Manager, Catia, called us in and told us we were invited to attend the Annual Prize Giving. This year was to be special as prizes for the last 3 years were to be awarded! As our busy social calendar had nothing else in it for that evening we got ourselves dressed up and headed on to Funchal. 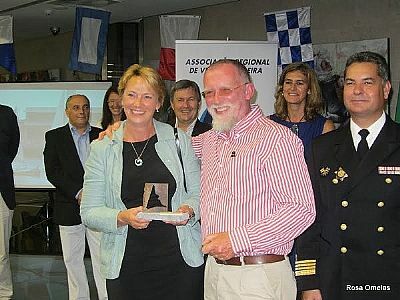 The award ceremony was held in the Cruise Terminal. This was our first time in the Cruise Terminal and we were very impressed. The evening was very pleasant, we were welcomed by other sailors that we had met previously on the Regatta's we participated in and Catia introduced us to one or two other people. Towards the end of the ceremony we were delighted to hear 'Red Ruth' announced as the winner of the Open Class for 2013 season. Here we are receiving our prize from the Port Master. As we have now been out of the UK for over 2 years we are required under Portuguese Law to provide evidence that we have paid the VAT on Red Ruth. Portuguese Customs and Excise require us to provide a Form T2L. On contacting HMRC in UK, who told us they don't have such a form and the problem is 'all ours', we did some research and visited some sailing forums. One really helpful forum provided a telephone number at HMRC and the name of a lady called Moira Hand who knew and understood the problem. After contacting her, receiving an email with the forms, duly signing them and returning them we had said T2L form in our possession after 3 weeks. 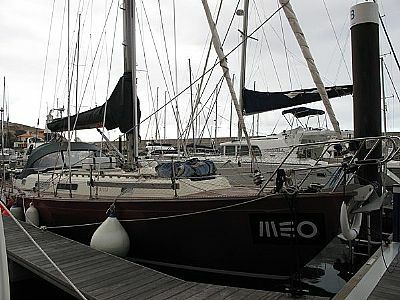 Our heartfelt thanks to Moira and we will publish her contact details in 'Links' for any other yachtie stuck with similar problems in Portugal. The end of October is looming and along with it the need to change the clocks. Days here are definately shorter now and we will be glad for the extra hour of daylight in the mornings. The nights are cooling down now (to around 17 degrees C) but the days are still warm and sunny. We have had a couple of days of heavy rain, which we don't mind as it means a day less of watering the garden! Our work at the house is also complete with two new seating areas to enjoy the view of thegarden, sea and islands (through the gap in the mountains). 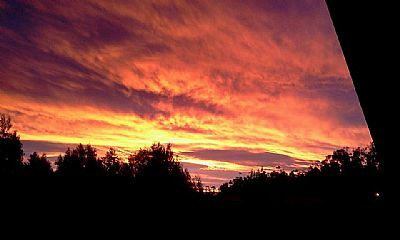 With the change in the seasons our sunrise's are spectacular - although the old adage hold true. 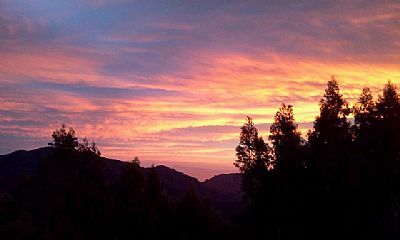 "Red sky in the morning is a Sailor's warning". Two hours after these pictures were taken we had torrential rain.